And I don’t want to wait. Again, here’s a bit of poetry that I’m not sure I want people who know me to know about. Just a-writing out my frustrations with relationships. Pffft, I mean the absence of relationships. So, growing up my parents listened to all kinds of music. I remember still having a record player with records of Tina Turner, Sting, and some Motown mixes. My mother loved John Cougar Mellencamp. I had a huge crush on Michael Jackson and Prince. I loved Madonna in her early years and loved the bad acting in her movie (wasn’t it called Desperately Seeking Susan?). I even still have a poster of Prince from when the song Kiss came out. It’s Prince and the New Power Generation and in the white background is a huge pair of lips. And of course Prince is in his iconic purple suit. I remember 8 track tapes lying around the house. My first cassette tapes bought especially for me were Salt n Peppa, and also the Wee Poppa Girls. I guess the last group just didn’t make it. I knew about George Clinton and the Parliament early on. If I could say one thing that my parents love, it was the p-funk music. At one point my dad and friends had their own little club that would have parties in a rented building. I remember being there, the only child, my mom dancing with no rhythm whatsoever to her favorite song “Set It Off”. I remember my mom finding a cassette tape on the ground after leaving a store, Metallica’s Enter Sandman. Did she throw it away? No, we jammed to it in the car, lol. And later on in life, for some reason I can’t explain, if we didn’t go to church on Sunday, we would watch CMT (Country Music Television). As I got older and got into anime, I started adding J-pop and rock to my music lists. And of course loads and loads of hip-hop. I say that all to say, these days, I’m confused as to what’s popular. I used to love hip hop and rap, but these days I wish for instrumentals to songs instead of the lyrics. I used to use Jay-Z, DMX, and Eminem to listen to as I wrote my angry young adult poetry. Now, I still use mostly older stuff. The gimmick that was the weird gremlin called Lil Wayne has lost its shiny long ago. And I finally flipped from toleration to outright disgust. So I’m driving along and listening to the local hip-hop station, and this “song” comes on that has a nice beat but is pretty much 75 percent bleeped out. The song’s hook is Drake I believe saying with an echo “I don’t care what my haters say, long as my b*tches love me.” That last part echoes about 4 times. Then there’s the rest of the song, where the word b*tch is said over and over again. So I switch the station, and guess what’s playing?! Are you frackin kidding me?! So my son and I begin to count how many times b*tch is said. I got lost around 30 something. My son believes he got past 50. Fifty times. The word is said. The whole song is about basically how many awesome groupies Lil Wayne has to bump uglies with. Apparently, some women see something in face-tatted drugged up midget gremlins. I’d rather puke. I’d rather an actual midget like Peter Dinklage from Game of Thrones touch my naughty bits than that disease looking assault on my senses. And little people are one of my top phobias!!! Maybe I’m getting old. I mean, is this hip hop now? Let me clarify, my favorites were/are not saints by any means. Jay-Z, Tupac, Eminem, the Wu-Tang Clan, DMX. No, these were rough men saying very harsh things. But there was style! As a poet, I picked a part their rapping style, their flow, the way of flipping words and making things rhyme that shouldn’t, making metaphors stretch and flip until you went from Play-Doh to Nickelodeon slime consistency. I loved it for the art of it! When I was angry, depressed, those songs help me write out my frustrations instead of slitting my wrists. Today? 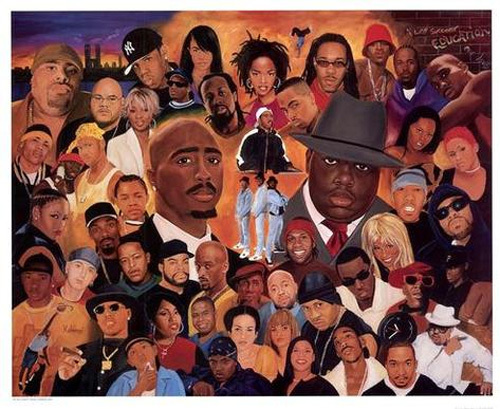 Today’s favorite rappers? 2 Chains, that yells his name constantly and dresses like Rick James? Nicki Minaj who really actually has skill, but is too busy vomiting retardedness on the mic and across our eyescape. She looks like a frackin Pokemon. My rappers do NOT look like Pokemon. My rappers can reference anime and pay homage to the kung-fu culture, but they should NOT walk around in cosplay everyday. And bad cosplay. I can totally see her being added as a creature on Digimon or Pokemon or frackin Power Rangers or something. Nicki Minaj – I choose you! I got sidetracked. I got distracted by the crazy. Ooooooh shiny. Shiny as Minaj’s plastic body part additions. I don’t remember my parents going through this disgust with the newer artists that came out in my time growing up. Is there something wrong with me? Am I missing something? All I know is when I first heard “Bandz A Make Her Dance” I assumed it was about actual marching bands… Because I had only half listened to the hook. Until the internets taught me it was about bands of money to make a stripper dance. And I felt ooooooold. And naïve. On a separate note/different genre: why is that big forehead walking vocal chord dissonance known as Rhianna still singing? Her voice is what I imagine the first level of purgatory to sound like. When her song starts that says “throw it up, throw it up” I literally WANT to throw up. The sounds coming out her mouth is not fit for human consumption. Smexy Times and Sugar, both bad, but oh so tasty! So today after work was spent running around trying to get some replacement pieces to my costume for the anime convention I’m heading to tomorrow. *Sigh* Another downside to being extra curvy, couldn’t comfortably fit into the costume I ordered. Luckily, the alternative I found is actually more comfortable than the one I bought, even if it had fit right. I’m going as Medusa from Soul Eater. It looks soooo awesome. The Monster Teen is going to be rocking out in a full Ezio costume from Assassin’s Creed. We are proud geeks and our flag is gonna wave HIGH tomorrow!!! Lets see how much fun my back can take without me falling to pieces in pain. Percocet is my friend, Flexeril is my friend. Rinse and repeat. Anyways, on to what’s been bothering me lately. I miss smexy times. Not enough to leg hump the nearest male, but my hand gets a work out *waggles eyebrows* if you know what I mean. I just hate the baggage that comes with it. Smexy times without a valid relationship doesn’t work for me. When you literally get sick to the stomach from a 1-nighter in your young and dumb years, you learn never to do it again. And that your conscience is a strong evil monster. So I can’t have smexy time without a relationship. And a relationship that I feel is actually going somewhere. I made a mistake a couple of months ago of smexin with a friend I thought could be something more. Though I don’t regret it, I do. Yeah, doesn’t make sense, but I have no other way to explain it. Before that, I hadn’t been with someone for a loooong time. We’re talking more than months. And that last relationship wasn’t a good choice either. Never go backwards to a relationship that’s ended, is usually my motto, but there’s one man who I let back into my heart over and over. He trashed it plenty of times (after I first trashed his many years ago), to the point where after he told me he had a new girlfriend while I was deployed and miserable… Well let’s just say my knickers will never talk for my heart with him anymore. So smexy times… I love them, and can’t have them without someone I really care about. New online guy seems cool, but I can’t yet see myself letting him get anywhere near my giggles n bits. But I have to be careful. I know myself. My giggles n bits have seriously rewired my brain when they feel they’re gathering dust. They’ll convince me that someone is worth letting in to my knickers, when my brain and all those wonderful kittens in my head are screaming No! I guess I’m somewhat like a guy in that moment because the wrong body part is doing the thinking for me. I even have two guys from the job already starring in random fantasies when I have those rare moments of free brain wandering. My little sister has cosplayed for years… I think she started around 12. I myself only went dressed up to a convention a for the first time about a year ago. I loved it, and have been preparing for my next chance to go (3 costumes all ready to go!). Of course, the last time I went I was in another country, so yes I was one of the few Americans, and definitely the only brown crayon comrade out there. But this time I’m going in the states. And then my sister (who is the cosplay champ in my eyes) sent me this link called “I’M A BLACK FEMALE COSPLAYER AND SOME PEOPLE HATE IT.” People upset at a black woman who loves cosplay because she’s not the “right” skin tone? I could have sworn all those characters were Japanese O_o. It made me realize that when my son and I go to our first cosplay convention in the states, we might not be as accepted as I thought we would be. Will someone actually look at us, and DOWN at us for dressing as a character that doesn’t match our skin tone??? Even though I’ve never received any racism towards me, I shouldn’t have to even worry about it! My family, from my parents, siblings, and son are proud geeks, and should be able to wave our geek flag like anyone else. No one should be judged as they experience their hobby to the fullest. Except for Furries. I’m sorry. You guys scare me. Sorry for my geek prejudice (geekjudice?) Okay, I’ll go hide in a corner now. Seriously, I hate the whole dating game. I hate “getting to know someone” and hoping and planning out possible futures in my head, all for it to fall to pieces. Maybe it’s me, and I’m just too controlling, too much, needing too much attention. Or maybe it’s them another time, where they aren’t ready for the level of commitment. Or maybe it’s both of us another time, where we just aren’t compatible. Or maybe I just keep opening myself to the wrong people. It may be a problem in what attracts me. No… I’m not the chick that’s attracted to the bad boy… although they can have those kind of qualities in some aspects I guess. I realized the other day that it probably all has to do with my favorite anime character, and why he is my favorite: Kakashi Hatake from Naruto. Now, stay with me, were going deep into geek territory. So… Kakashi is the teacher or sensei of the main character. He’s very quiet, apathetic, confident and blunt, and was known to be a genius at a young age. He also lost his mother and then his father at a young age. His father committed suicide. Both of his teammates died early on his life, so at times he’s a pretty sad character. He also loves the pron. Although he cares about other characters, when you sit back and start dissecting this action anime character, you realize he really is more caring about his past and himself, and not really letting anyone else get close to him. The problem is… that kind of person may be awesome in a ninja cartoon. Not in real life. Those kinds of people in real life end up being emo messes that have breakdowns or just crap over everything. And I’ve been somehow finding that kind of person over and over again and dating them. Shoot me now. So, yes, maybe I should just stick with my fantasy characters. I know my friends and family want me to get back on the horse and start dating again, but… I’m tired of the “characters” offered. This post is a confession. I’m addicted to reading. It’s a healthy addiction I think. I read alot of books, mostly urban fantasy and horror. But there’s a seedy underbelly of my healthy addiction. It happened when I stumbled upon fanfiction. It was around 2002-3 timeframe. Buffy was in its 6th season I believe. And I just wanted more in the story-line about Spike. Because Spike was hot. You know, they showed a lot of James Marsters’ skin the 6th and 7th season. Nummy. Siiiigh. Ahem, anywhoo, I wanted more with my characters. So I’m spending the military’s money cruising the internet at work, looking for stuff on Buffy (you know, like little tidbits, maybe some spoilers, pics of J. M. with his shirt off and such) and find this website with stories. Huh? It was a frackin ultimate high. It was like… remember the What If Marvel Comics? I still have somewhere one from right after the Phoenix Saga. It was taking your favorite characters and continuing the story, or changing it so that what you wanted to happen, happened! It was GREAT! And then… I found the dirty stories. Of course I did. And hey, my mind is already pretty perverted, but now, where in Season 6 when Buffy and Spike first get all HBO on the screen and it fades to black, now, I had the full story! This was back before I had my own computer and there was such a thing as the government blocking sites or monitoring a regular office’s computer (or I think, no one ever said anything to me, so meh). So I would read all day long. I would print off some chapters to a long fic I was reading, and take it back to my barracks room to finish. I read through the daggone internet all the Buffy fanfic that I could get my hands on until… I couldn’t find anymore to read. It was like, my crack ran out. Sure there were still some stories here and there, but not enough to feed my beast. People weren’t writing fast enough. I’m a frickin speed reader and they weren’t producing! So… I left it for a while… breaking myself away from the addiction. Until… I started getting into Naruto. Yes, Naruto. Hey, I’m not sure where in the timeline of my life this is, but I know it had to be about 2003 or later because there were already tons of Naruto episodes out. I remember visiting home, and my young sister going on and on about this silly ninja cartoon that she loved. Now, I remember watching Sailor Moon as a younger dimensionthe5th, an even watching a couple of episodes here and there of Pokemon with my siblings (and remember, I can’t watch the first Pokemon movie ending without shedding a tear). But this, this was straight up anime, and I wasn’t THAT kind of geek yet. Until, I sat and watched a couple of episodes. And saw the character Kakashi Hatake. And by then I had my own computer, and I searched… for fanfiction. Oh dear baby Jesus. It was the super high all over again, and I hid my addiction because who wants to admit to reading dirty stories about cartoon characters? Ha… there’s many on the internet because there are huuuuuuge fanclubs. I even felt bad sometimes watching the show, getting my memories all mixed up, trying to think “Did Kakashi really do that in the anime? Um, no, because only in the fanfiction world would he do that with Sakura because they aged her up.” And after Naruto, I realized there was fanficition for almost any tv show, anime, any book, move, heck even pop stars! Even my beloved X-men characters. Storm and Wolverine definitely should’ve gotten together. The fanfics SAY SO! The writing was sometimes really good, sometimes written by a 13-year-old that obviously never had kiss let alone understood that nookie just did. not. work. that. way. And let’s not even talk about the male pregnancy fics. What in the blue blazes ? I still say it’s a better addiction than most. I mean, this is my brain on fanfiction. Slightly more perverted than normal. Okay, I’m lying, my pervertedness is over 9,000 with a cherry on top. Not because of the internet. That just enhanced it. Don’t look at me like that. What’s your favorite character, book or show? I dare you to search for some fanfiction for it. Double dog dare you.